A year after terror ripped apart Chabad House, Matthew Schneeberger walks down the lanes of Nariman House to gauge the mood at the Jewish centre. In the Talmud (one of Judaism's central texts), we are told that: 'Whoever saves a life, it is considered as if he saved an entire world.' 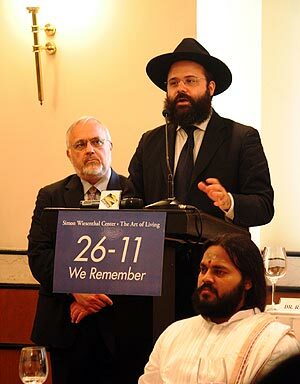 Though terrorists were able to kill nearly 200 people in Mumbai last year, we believe that the bravery shown by Sandra Samuel, a Catholic, in rescuing young baby Moshe, has saved all of us," says Rabbi Avraham Berkowitz, a Hasidic Jew from New York City and the director of the Chabad Mumbai Relief Fund, who this week led a candle-light vigil at the Nariman House in Colaba in remembrance of those who lost their lives, including the six at Nariman House itself, during the November 26-29, 2008 Mumbai attacks. While the other 26/11 targets were high-profile, well-known city icons -- two beloved luxury hotels, a popular eatery and the city's most famous railway station -- Nariman House is a small, non-descript six-storey building in a narrow, hard-to-find bylane, unknown to most Mumbai's residents. But inside was the Chabad House, Mumbai's outpost of the Hasidic Chabad-Lubavitch movement, which served as one of the city's Jewish cultural and religious centres. Thus it featured prominently on the Lashkar-e-Tayiba's hit-list, and became the scene of a bloody 40-hour siege, which ended with Indian commandos dramatically storming the building after being air-lifted to the roof by helicopter. And though the 29-year-old Israel-born, America-raised head of the Mumbai Chabad House, Rabbi Gavriel Holtzberg, his pregnant 28-year-old Israel-born wife Rivka, and four other Lubavitch members were all killed during the battle, the Holtzberg's two-year-old son Moshe was saved, thanks to the courage and quick-thinking of the Holtzbergs's Indian Catholic cook and nanny, Sandra Samuel, who ran up three flights of stairs to grab a weeping Moshe, before escaping to the streets below. Samuel is with the now three-year-old Moshe in Israel, where a service to honour Mumbai's fallen was to be held on Thursday at Kfar Khabad, a Chabad-Lubavitch village in central Israel. According to the Hebrew calendar, November 19 marks the first anniversary of the 26/11 attacks. "Sandra Samuel represents the best of humanity," Berkowitz said with conviction, after recounting her heroism. 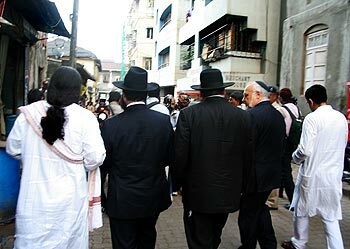 Image: Jewish leaders from Israel and New York walk down a Colaba bylane, on the way to Nariman House. As director of the Chabad Mumbai Relief Fund, which reportedly touches almost Rs 50 million, Berkowitz has been charged with rebuilding the Mumbai Chabad House, and restoring the Chabad-Lubavitch presence in the city. Owing to security concerns, the rabbi did not divulge much information about the new Chabad House in Mumbai, but did promise: "We will not be afraid, we will not be deterred, we will rebuild our institutions, stronger than before," adding that the new Chabad House in Mumbai, to open November 26, would become a "symbol of peace and unity" for people of every faith, and that all would be welcome. Berkowitz also revealed that a memorial service for the Holtzbergs and other victims of the attacks will take place on the evening of November 26. While Baby Moshe won't be making the journey, his grandparents will be here to pay homage. The local Jewish community in Mumbai has organised a memorial service on November 25, at a synagogue in nearby Kala Ghoda. To demonstrate the commitment of the Jewish people to the Chabad movement in Mumbai, Berkowitz mentioned that he recently spoke to Israeli Prime Minister Benjamin Netanyahu, and told him about his work with the Mumbai Chabad House trust fund. Netanyahu praised his efforts, and was apparently unequivocal in his support for India, saying the two countries have much in common and that Israel 'must show solidarity' with India now and in the future. 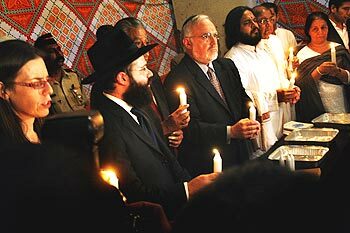 After Berkowitz's remarks, a group of about forty people, including Israeli Consul General in Mumbai Orna Sagiv and former Central Bureau of Investigation director D R Kaarthikeyan, lit candles and observed a moment of silence. In the photograph: Israeli Consul General in Mumbai Orna Sagiv, Rabbi Avraham Berkowitz, former CBI director D R Kaarthikeyan (partially obscured), Rabbi Abraham Cooper, Associate Dean, Simon Wiesenthal Centre, Swami Gnanatej of the Art of Living Foundation, Father Ceasar D'Mello, Rector of the Cathedral of the Holy Name at Colaba, at the candle-light vigil. Before leaving, Berkowitz ran his fingers over bullet holes in the wall opposite Nariman House. Despite reconstruction efforts, the building still shows obvious markings from last November's attack. Pockmarks from bullets line even the inner staircase, and the windows remain covered with plastic tarp. A partition has been built to keep the curious from reaching past the entrance to the first floor. From the staircase, however, bullet holes are still easily visible on the first floor, amid construction tools and building materials. In places, huge hunks of the concrete wall are still missing. As Berkowitz himself stressed, for the Jewish leaders who had travelled to the city, it was a day of mourning, but also one of inter-faith hope and healing. Earlier, before the candle-light vigil, at the nearby Trident Hotel, leaders from eight different faiths spoke out against violence and terrorism. 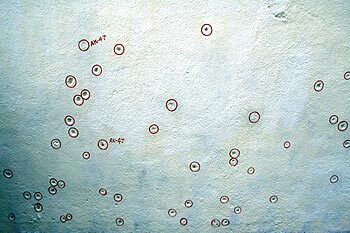 Image: The wall opposite Nariman House, riddled with bullet holes. There, while calling for 'moderate Muslims' to reject the violent perversion of their doctrine by violent extremists, Berkowitz also shared a story about Jewish-Muslim brotherhood. He said that, while waiting to board his connecting flight to Mumbai, he was at Dubai airport, when a Muslim man travelling from Demascus asked him if he knew in which direction was Mecca. "I took out my compass, and after we figured out where to find Mecca, I told him that my name is Abraham, and that I need to pray too, but to Jerusalem." For his part, Dr Khwaja Iftikhar Ahmed, founder of the Interfaith Harmony Foundation of India, echoed Berkowitz's calls, saying: "Indian Muslims, who are the second-largest Muslim community in the world, after Indonesia's, and the one with deepest democratic tradition, did a great service to Islam by delegitimising (the 26/11 attackers) by refusing to bury their bodies." Indian Muslims, Dr Ahmed added, "are not intimidated by extremist religious leaders and are not afraid to speak out against religious extremism in our midst."